BookMyShowhasbeen something that remains constant in our lives. Especially for the younger generation, it is the best way to get tickets done for movies. It saves us from standing up in a queue and wasting our time while we can simply book our tickets with BookMyShow with amazing offers as well. On top of that, one can easily get updated with movies without sneaking out and coming up empty-handed. However, the thing that might take you by surprise is that a 24-year-old Ashish Hemrajani managed to gain such success. In a matter of 16 years, one might not believe it but BookMyShow has seen its own share of rising, fall and then an outstanding comeback. 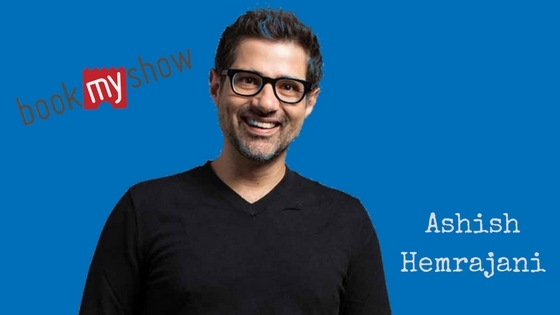 In 1999, Ashish Hemrajani was on a trip to South Africa while working for an advertising firm, J. Walter Thompson. He completed his business administration masters and then joined them for further growth. However, the life-altering trip made him quit the job while he listed to rugby tickets on a radio programme or maybe some alcohol in his system. As the hangover effect, he finally got the guts to quit his job for something that he believes in. We came across his first rise as ‘Bigtree Entertainment Pvt. Ltd.’ with his bedroom as his office. His two co-founders Rajesh Balpande managed finance while Parikshit Dar managed Technology joined him in this venture. However, it was difficult to reach at that point due to struggle and no one was ready to invest in their business. The first investor was anything but a cakewalk for them who was JP Morgan Chase Capital Partners. However, with time the Hemrajani net worth Ashishincreases at a great pace. TheCompany managed to reach the number of 150 in 2001 after getting funds from Newscorp twice. In 2002, there were only 6 members left in Bandra house that was working for this application. In the dot com heat after a great bust, everyone receives their own share of burns. BigTreeEntertainment just managed to burn to the grounds (almost). No investors were left with them, they went through a lot of loss and the situation was getting downhill at a fast pace. Only Delhi and Mumbai become their agenda while shutting off major offices and cutting up employees’ salaries. They invested every single penny that they had even earned to rise again. And Rise they did. After the struggling time till 2006, they were losing hopes but they learned from this fallout. No matter about the hopes, but Ashish was full of confidence and courage, he knew what he has to do and he stuck to it only. With the change in the Indian market after the dot com, there was better debit cards, internet, etc. Hence, in 2007, they made a comeback with the Hemrajani BookMyShowAshish and 24.1 crores total worth. A hefty investment by Network 18, earned them a lot of things while it leads to success. Now, they were organized, cautious and prepared after the loss of more than 5 years. They knew every hook and corner that might go wrong and already get an alternative, saved a huge amount, and took many precautionary steps. The Hemrajani success story now became a sensation among the audience where they used to hire younger talent and we’re working with financial crises on a global level. It became a huge success with their struggle and by 2011, the total revenue counted by the company was INR 16.09 crore. Apart from this, there is so much about the BookMyShowsuccess story from the‘The Hottest Company of the Year-2011-12’ award to another of the biggest award as ‘The Company to watch out for’. This changes a lot of things for them and us while they rebuilt from scratch and gained a lot of popularity and success at an amazing rate. This made it a reliable solution for so many things keeping us all hooked to a seat.